You’ve surely have noticed the rise in the number of Chinese tourists. Maybe you have even started to target Chinese tourists for your tour and activity business. That is not surprising! Their increasing buying power leads to the status of the most desired customers. So, Chinese tourists have already become the driving force for the travel industry. The trend of Chinese traveling abroad is increasing. So, tour and activity companies have to focus on this new potential customers. The thing is, China has already surpassed Japan and become the No.1 outbound tourism market. According to the World Travel Organization, there will be approximately 100 million Chinese people traveling abroad by 2020. Tour and activity owners have to pay attention to tourists from each province of China since they have different characteristics (tourists from North of China and those from the South). Also, most Chinese tourists travel abroad for two reasons: business (46%) and/or leisure (31%). Millennials like outbound traveling routes, especially destinations such as Europe and Australia. To attract Chinese tourists, first, you have to define their needs. Then work out a strategy to target Chinese tourists. 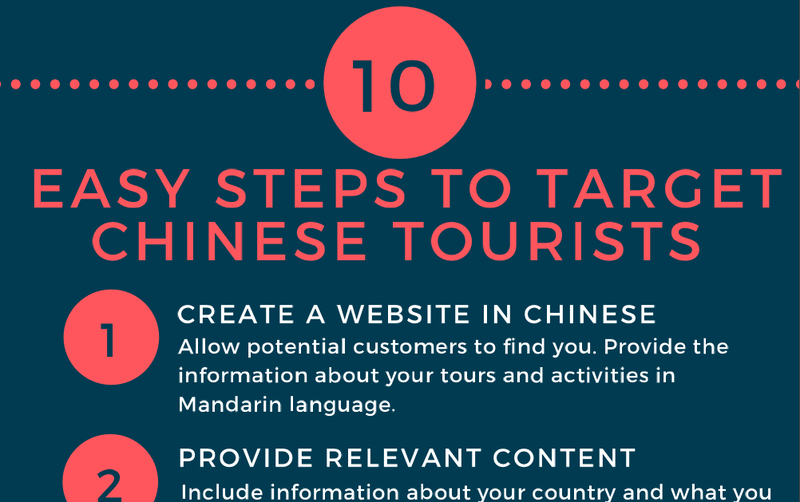 Here is a checklist with 10 steps to help you target the right Chinese tourists for your tour and activity business. Feel free to reach out to us if you have any questions or comments. Contact us or share it right here. If you find this checklist helpful, share it with your friends and colleagues!